Here you will find all of my custom content that is up for download. If you come across any issues with my custom content please let me know. Please DO NOT leave issues in comments, I get no notifications of these. Please send me a message directly! Thanks! All downloads contain Ad.Fly links and hosted by MEGA, alternate links are ad free and hosted by SimFileShare. Come see new content, chat, updates, report bugs and more! Are you interested in beta testing my mods, getting downloads early, or just want to support me as a creator? This is the first item I created for The Sims 4. 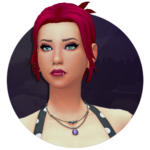 A simple recolor of the short base game hair in 15 ombre colors. Here you have 40 hand painted recolors for the base game medium length hair with bangs. I have created for you 30 Lipsticks in many different colors and shades to work well on any skin tone. These are the first lipsticks I have made for Sims 4 and I had a lot of fun making them, so hopefully I will be making more in the future. 30 bright colored PVC pants. These were made as a request on TSR. I have made for you 30 cyber/rave goggles. For all your industrial Sim life needs! 100% Hand Painted. Found under Hats and enabled for unisex! Here you have pvc accessory leggings, with a great goo drip on top! Comes in my 30 color pallet for Teen-Elder Females. Here you have pvc pants, with a great goo drip on top! I have made for you PVC hot pants with corset lacing on the sides. This download come fully loaded with two versions, a zipped up version and a zipper down. As always hand panted. Enjoy! Today I have for you a ruffle top for your teen-elder females. Comes in my 30 color pallet. Enjoy! Today I have for you 30 recolors of LeahLilltih’s Melephar Choker! This version has a dark gothic feel. With hand painted PVC textures! Enjoy! Today I have for you a PVC swimsuit top for Teen-Elder Females! It comes in my 30 color pallet! Enjoy! I have made for you a short pvc dress in my 30 color pallet, for your sims that enjoy living on the darker side of life. I have been asked to make a dress a lot lately, so here it is. Hope you enjoy it! As always hand panted. I have made for you a short ruffle Christmas inspired dress in 4 colors, for your Teen-Elder females. I have made for you recolors of the base game Heat Seeker Fireplace in my 30 color pallet! It also has a black mantle! Enjoy!